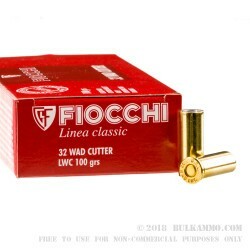 Fiocchi is going old school in style with their “Linea Classic” (Classic Line) brand offering in these .32 Smith & Wesson Long, Wadcutter style projectile cartridges. The Wadcutter is used to punch a clean circular hole through a paper target for maximum viewing of the shot placement and was especially popular during earlier competitions and where smaller calibers were used. 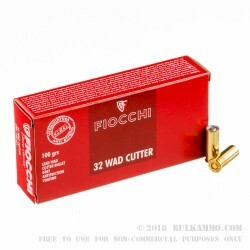 The very strict restrictions on how a true wadcutter projectile must be loaded makes them almost relegated to the segment of the market that falls under the “relic of the past” category. 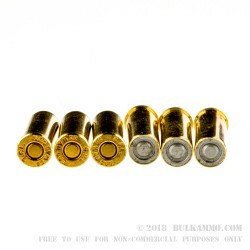 The clean holes and novelty of the round, perhaps keeps them around in a centerfire caliber instead of just keeping them alive in the pellet and air-gun competitions. The projectile requires special lubrication to prevent unsafe “leading” in the forcing cone and cylinder and barrel rifling of a revolver. Typically, the accuracy that comes along with the wadcutter is enhanced relative to other bullet profiles and loads. There is a caveat too, though, that physical lead removal is normally needed after a shooting session to ensure the gun is safe for use at the next competition or trip to the range. 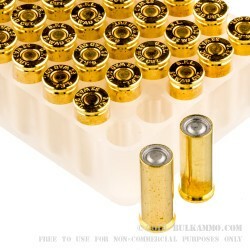 This round is suitable for use in most revolvers that need a low velocity round and a high contrast target picture.